Recently diagnosed with malignant brain cancer, Sen. John McCain (RINO-Arizona) is making use of whatever days or months remaining in his life to do as much political damage as possible. See also “John McCain’s foundation is funded by Saudis, Rothschilds & Soros“. Early today, McCain is one of three fake-Republican senators to kill the GOP’s last-ditch effort to repeal Obamacare. Joe Tacopino reports for the New York Post that at about 1:30 a.m. this morning, just hours after the “skinny” repeal was released with the hope that it could be sent to the House and be further worked on in committee, the Senate voted on the bill. Although the 51-49 vote was largely cast along party lines, despite intense pressure from the White House, three so-called Republicans scuttled the repeal by joining Democrats in voting “no”. The three reprobates are John McCain, who had returned to Washington from Arizona following a brain-cancer diagnosis, Susan Collins (RINO-Maine) and Lisa Murkowski (RINO-Alaska). Just before McCain entered the chamber with the vote already underway, he turned to reporters and smugly told them, “Watch the show,” according to Politico. As McCain cast his “no” vote, an audible gasp could be heard from the assembly followed by cheers from Democrats. We should have known John McCain is the devil’s spawn. 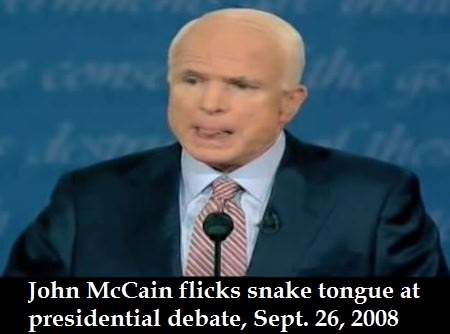 As you will see in the video clip below from McCain’s first presidential debate with Barack Obama on Sept. 26, 2008, in the space of a little over one minute (1:14 minutes), McCain flicked his tongue out like a snake almost every second, totaling a dizzying 58 times — at the 0:01, 0:02, 0:03, 0:05, 0:06, 0:07, 0:08, 0:09, 0:10, 0:11, 0:12 (twice), 0:13, 0:14, 0:15, 0:17 (twice), 0:19, 0:20, 0:21, 0:23, 0:24, 0:25, 0:26, 0:27, 0;29, 0:30, 0:32, 0:34, 0:36, 0:37, 0:38, 0:40, 0:41, 0:43, 0:44, 0:45, 0:46 (twice), 0:47, 0:48, 0:49, 0:51, 0:52, 0:53, 0:54, 0:55, 0:57, 0:59, 1:01, 1:03, 1;04, 1:05, 1:07, 1:09, 1:10, 1:12 and 1:13 marks. Left click on the wheel icon in the bottom right of the video. McCain is the worst of all the snake tongue-flickers I’ve chronicled. H/t FOTM‘s Facebook reader Faye N.
This entry was posted in RINO, Satanism and tagged John McCain flicks tongue. Bookmark the permalink.